Adopted at birth, Stephanie Hanson Caisse began a search for her biological parents and learned her father, Gary Norman Young, was killed in the Vietnam War before she was born. To unravel the mystery of his death, she discovered first-hand from other veterans of her father's world of courage and bravery as a helicopter crewmember in 1969. She learned of the remarkable relationship that exists between Marines and their Navy Corpsmen, and realized she has now inherited the honor and respect given to her father. Same great story; just a new size and cover! Stephanie continues her journey, picking right up where A Corpsman’s Legacy left off in this fascinating sequel. Having learned that her birth father, Gary Norman Young, was killed in the Vietnam War before she was born, she unraveled the mystery of her father’s courage, bravery and finally his death as a Navy Corpsman assigned to the world-famous Marine Corps Purple Fox helicopter squadron. 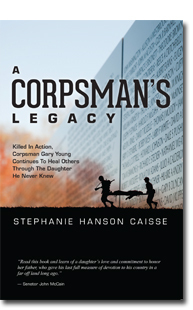 Now, as she uncovers even more information about her father and his crewmembers, Stephanie continues to help Vietnam veterans open up and realize that through all the heartache, there is light at the end of the tunnel. Stephanie’s journey also follows the Foxes as a new generation of Marines goes to war, and encounters a stunning twist of fate that ties the Vietnam and Iraq wars together like never before. A Corpsman’s Legacy Continues chronicles the tremendous kindness and courage of our nation’s veterans as they talk openly about a time that shaped their lives forever. And woven throughout the many stories is the power of one man’s legacy to heal the wounds of war.